Where do butterflies go in the rain? When I was a lad, not so very long ago, I was given the gift of the book entitled Why Does A Glow-worm Glow (1977) being a compendium of answers and solutions to a number of science and natural history related questions. It was a fascinating little book given that so many of the answers provided were to questions that perhaps you have never thought to raise in the first place. Chief amongst these, to my mind, was the principle of where do butterflies go in the rain? Obviously, the key feature of the butterfly is its apparently erratic flight upon the summer breeze; they are indicative of summer sunshine but, as we all know so well, summer in this country is so often “interrupted” by the occasional shower, so what then for the butterfly? It really is a case of out of sight, out of mind. As far as I am concerned, Morris Men have a lot in common with butterflies, yes they have their grace and gaudy colours, but they are also a feature of the summer months, so where do they go in the winter? It is along these lines that, when dancing out, so many members of the public are curious to know just that: where do Morris Men go in the winter? Out of sight, they might be generally forgotten by the general public yet, in private, and behind closed doors, we beaver away at our art trying to perfect what we know, and learning anew. It is the hidden, unseen, almost clandestine, element that fascinates me, something that forcefully came to mind when I attended the Morris Ring’s Jigs Instructional for the first time in Bottom Smackington. Whilst perhaps our presence was known to those in that friendly, accommodating village, just a few miles down the road, no one would imagine such a dangerous concentration of Morris Men. Had anyone seen so many fine men congregating in that village hall, they might have speculated along the lines of some sporting fixture or interest group. 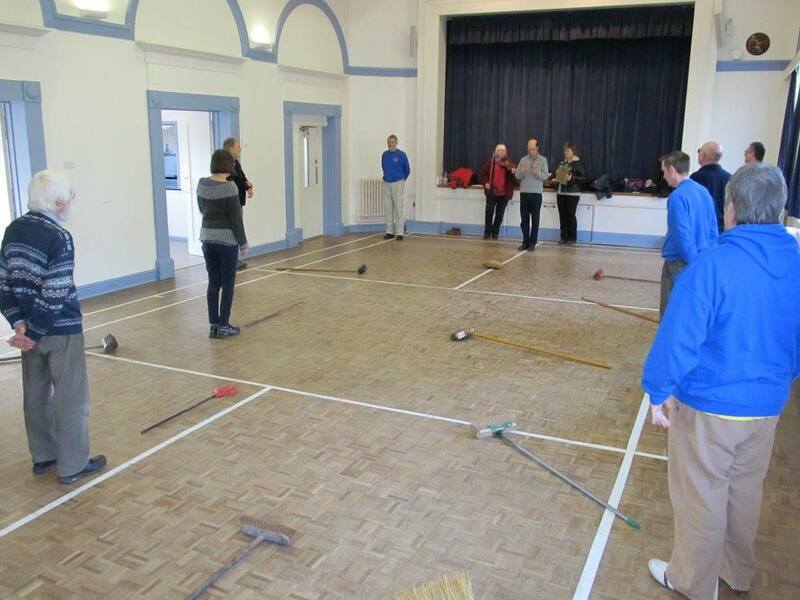 What then might the people of Burton have made of a gathering of fine folk in the Gladstone Village Hall on the morning of Saturday 24 January 2015 with brooms in hand? Surely even those with the most vivid, or warped, imaginations could not have guessed that we were each treating our respective brooms to a morning out dancing. 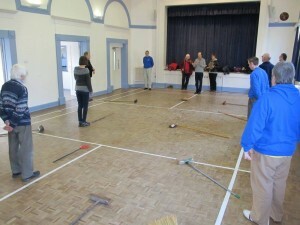 Yet that is what we did, it might be remarked that it is so rare that one gets to spend quality time with one’s broom: all too often it is a relationship focussed on base utility rather than anything more engaging or indulgent. Of course, many in the know, as far as things Morris go, would be well acquainted with the idea of the eponymously titled Broom Dance but I wonder at how many, having never tried it, would sniff at its rather pedestrian and rambling execution? As far as the Mersey crew who were there on that fateful morning, there can surely be none who would recognise such a description. Despite our tutor’s youthful ease of performance, I think we all recognised the very real physical and mental demands of one should they want to work in symbiosis with the broom. 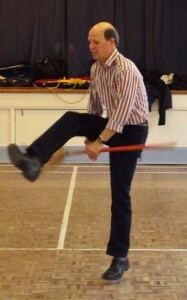 Many of us had seen Peter Morris deftly perform this dance previously with such ease and poise, I suspect this might have been to the forefront of their minds in signing up to attend this workshop but how we were to feel the burn! Although not travelling great distances, and although the pace is not necessarily frenetic, you may rest assured that it is a strenuous pursuit. Further, although the stepping lacks the confusion and downright offensiveness of something emanating from Sherborne, there is a degree of mental exertion in placing the right foot, in the right place, at the right, without stepping on one’s broom of course. That is to say nothing of the very great dangers to be incurred when twirling and thrusting one’s broom between one’s legs: some very nasty snagging occurred I can tell you. So, amidst great puffing and panting, and the occasional whimper as broom falls to the floor or is trodden upon, some of us lumbered through this dance immediately driving out any of the effortless grace which we had witnessed earlier. Indeed, as the Foreman so deftly pointed out, the key to the dance is to precisely make it look effortless, yet that most simple of directives proved the most difficult to live up to. If nothing else, as we departed for the Inn at Ness on that Saturday lunchtime with our brooms between our legs, many of us looked upon Peter Morris in new light. Apparently he had, at this time, not long turned 40 but here he was with the energy, stamina and agility of one half those years. So, where to butterflies go in the rain? Or, more properly in this case, where do Morris Men go in the winter? Well, they secretly hole themselves away in secret locations to perfect their art. Otherwise, they whip domestic tools from their mundane and humdrum existence to enjoy a new outlook and unnecessarily close proximity to the owner’s crotch. The thing is, obviously no one would ever imagine such things occur: they are happy to see a pretty butterfly on the wing on a summers day but otherwise give no thought to where they might be when out of sight. Laithwaite, Eric (1977). Why Does A Glow-worm Glow. London: Beaver Books.